When it comes to technology I’m a late adopter, and not even a fashionably late one at that. Take this blog, for instance, which I started in 2011. And now that I’m finally blogging, everyone else is twittering. My latest techno-tardiness is the eReader. While everyone else is out getting their iPads, Kindles, and Kobos, I just got a library card. As a voracious reader, the accumulation of books, even used ones, was getting really expensive and I was running out of room for them on my sagging bookshelves. As much as I love books, I realized I didn’t really need to own the entire Shopaholic series (in hardcover no less), I just wanted to read them. What better way to do this than to borrow them!? Walking into the Riverdale library, a breezy fifteen minute walk from my house, I was immediately impressed. The thirteen year old behind the counter gave me the grand tour which consisted of a fiction books section AND a non-fiction books section. Amazing! Even though she explained the mechanics of the library I still felt uneasy at the checkout counter. I had grown so accustomed to standing at the bookstore for hours agonizing over which of two books to buy-the one about the thirty-something British girl with a bad job and bad boyfriend who quits them both, lands her dream job and marries her strapping boss OR the one about the thirty-something North American girl with no job and no love, who starts a successful business, begins dating her gorgeous best friend for whom she always pined away, they quickly marry and move to England. I couldn’t wait to share the news with my brother Geoff, the brightest bibliophile I know and my fellow book club participant (the club consisting of me and Geoff). Except Geoff got a Kindle for his birthday a couple months ago. Geoff rattled off all the amazing features of the Kindle, including the fact that he can download any book he wants at any time for very little money, how transportable it is, how easy it is to read in bed and the awesome sound it makes when it “turns” the pages. I kept going. It was no matter though, while sceptical at first he had become an e-convert. I’ve always looked up to my two older brothers and I wanted to be on the same page as them (pun intended), so Geoff’s changeover unsettled me initially. Were eReaders really that good? Didn’t books lose their potency reading them on screen? Besides, eReaders couldn’t replace the friendly sound of your fellow library readers, could they? That feeling of being part of your neighbourhood? No, they absolutely couldn’t I thought the next day, returning my library books. To reinforce my point I decided to take my latest reads to the large space marked “community room,” so I could get to know my literary community. The room was empty. The silence though was broken by my phone. I fumbled around trying to answer it while balancing all my books, attracting pernicious stares from library staff. I couldn’t believe it. My 60-something year old Dad was ahead of me. My Dad! The man who has yet to really master the computer mouse and who once referred to my blackberry as a pineapple, had an eReader! I realized I need to start showing up earlier to the techno party. I dropped my new books in the library’s deposit slot on the way out the door. I’ve decided to get an eReader. But I can’t afford one just yet. First I have to pay off all my overdue library fines. 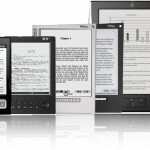 For those of you with eReaders I’d love to hear from you. How awesome are they? I love my entire Jennifer Weiner series….in hardcover. My husband would like to know if your library card counts as a piece of ID. ….can an e reader do that??!?? Interesting point. Does a bar code count as ID? Are we that advanced yet? Great blog Wendy! Mo and I have been talking about eReaders but I’m still totally on the fence. I think they are really neat, but a silly part of me just loves buying books and having them to lend to friends. You’ll have to let me know what you decide. I love to read but to be honest I am neither a library patron nor a eReader, kindle or kobo owner . I am one that loves to buy books, read them and have the pleasure of passing them on. If I get them back it’s a bonus but unnecessary in most cases. I just ask that they be passed on to others. So, I will remain technology challenged in that area until I remain the only one without some “product” and no one wants my books! Nothing better than paying a good book forward! Wendy, as a fellow book lover and Teacher-Librarian to boot, I too am a late bloomer when it comes to the eReader. I gave in last summer when I was in the middle of The Girl Who Played with Fire just hours before my flight was taking off. The thought of having both the book I was reading and the third book in that series in my carry on luggage was, well, just overwhelming – too darn big to carry around. I ran to the Sony Store, bought an eReader, raced home and loaded up 4 books (for less than the cost of one hard cover) and headed out to the plane. Have to admit, loved it on vacation but went back to the feel and smell of having a real book in my hand when I returned – might have something to do with the backlog of books I have on my bookshelves. Just recently pulled it out again and bought another book to download. Guess you could say I’m still on the fence!! Excellent compromise! Yes, reading the Millennium Series is quite the wrist workout and I am very much out of shape. get the Kobo app with it which is great if you like Canadian fiction. Books on the Kobo are pricier than the Kindle. The downside is that the iPad can’t be read in direct sunlight. Sorry for this lengthy comment, books and ereaders get me going. It is so nice to virtually meet you Lisa! Thank you so much for the helpful info. The back light and background are a big issue for me too as I read really late at night. I didn’t know about these iPad features or that the Kindle clicks. I think I would develop some sort of Pavlovian response! I hope my brothers didn’t give you any trouble in your babysitting days. Let me know if they did and I won’t let either of them play with my iPad. Don’t bother with the eReader. Everyone knows nobody reads anymore, especially not me. I’d really appreciate if you could do your blog on Podcast.